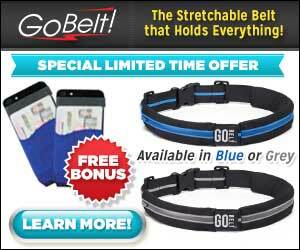 Go Belt is a stretchable belt that secures all your personal essentials discreetly to your waist. The comfortable, lightweight, extra stretchy material moves with you, and fits waists sizes 24-50 inches. Go Belt features 2 zipped, expandable pockets that fits dozens of items, leaving you feel secure without the use of any hands.